Blueberry Almond Maple Oats are simple to make for busy mornings! Hip-hip-hooray!! It’s Fit Friday and St. Patricks Day!! Make sure to remember to wear some green!! Miss Nichole from Pure Clean Fitness is here to hang out with us. I love having her visit and inspire our fitness! A Healthy Recipe Blueberry Almond Maple Oatmeal from me+ March Workout from Nichole= a healthy, happy, balanced life! ???? Blueberry Almond Maple Oats are made with whole grain oats, pure maple sugar, sliced almonds, and fresh blueberries. . . how can it NOT be amazing! Then to make even better, I just quick cook it in the microwave but you can also follow the direction on your oats for stove top cook method. Oh my. It’s such an awesome way to start the day!! There are so many healthy benefits to blueberries. . . The blueberry’s fiber, potassium, folate, vitamin C, vitamin B6 and phytonutrient content, coupled with its lack of cholesterol, all support heart health. The fiber in blueberries helps lower the total amount of cholesterol in the blood and decrease the risk of heart disease. AND that’s just the blueberries! Almonds and Oats are just as good for you so our Blueberry Almond Maple Oats are going to be tasty breakfast and it’s packed with awesome nutrition to help you through the whole day! Check out these other oat inspired breakfast recipes too: Fruit and Nut Steel Cut Oats, Blackberry Oat Smoothie Bowl, or Mango Coconut Chia Overnight Oats . . . you’ll love them all they are just fabulous!! Blueberry Almond Maple Oats are ready in 2 minutes for a quick and healthy breakfast! 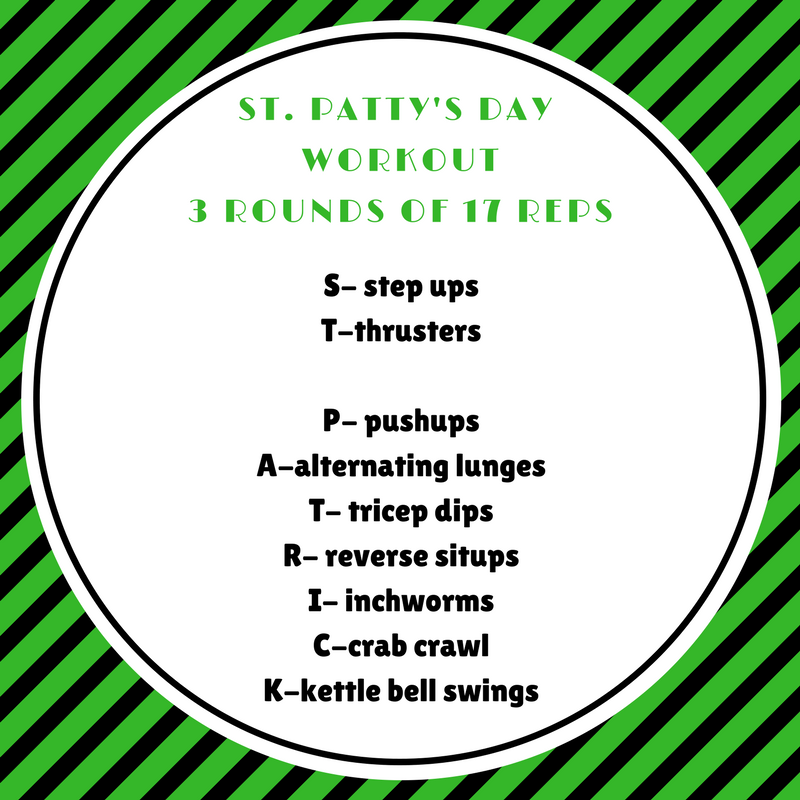 It is St. Patrick’s Day, which means we have to have a St. Patrick’s Day workout….of course! My house doesn’t seem to get to crazy for this holiday, but we do still have some fun with it. This year I made sure I was prepared with green clothes, in year’s past I have been scrambling like mad the day before trying to find anything green for my kids to wear. 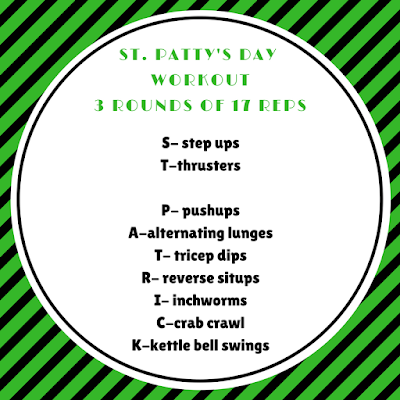 And along with being prepared I have planned out a fantastic St. Patrick’s Day workout. We have the letters spelled out. You are going to complete 3 rounds (March is the third month) of 17 reps each. Working out and being healthy is not a matter of luck. You need a goal and a plan. If you have found yourself in a little bit of a lull get back to it. In a microwave safe bowl combine water, oats, maple syrup, and salt; stir. Microwave 1 minute, stir and cook 30 seconds more. Top with blueberries, sliced almonds, and a drizzle of maple syrup.